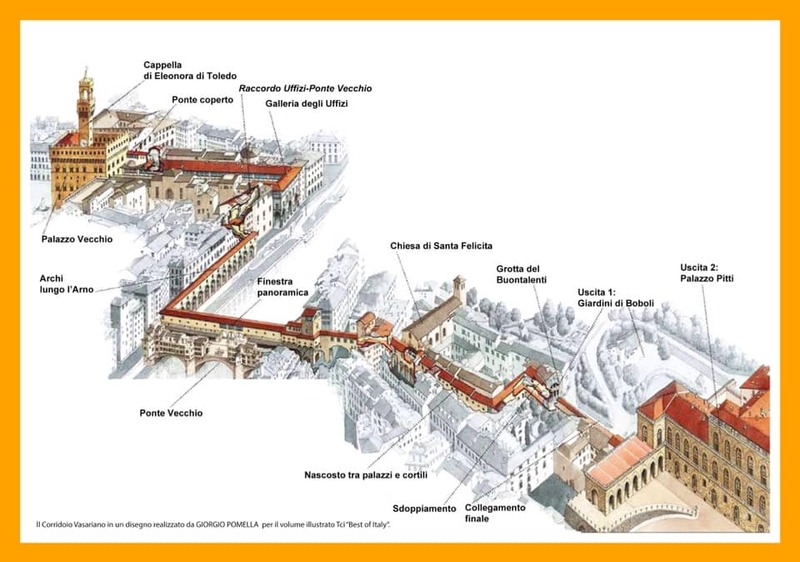 Update 20 February 2019: Tours of the Vasari Corridor. IMPORTANT: there are no legitimate tours of the Vasari Corridor being offered currently and no date has been fixed for tours of the corridor to recommence. Eike Schmidt, the director of the Uffizi Gallery, has announced that the Vasari Corridor will officially become a part of the Uffizi after reopening in 2021. Visitors will then be able to enter the Uffizi, stroll through the Vasari Corridor and then explore the Boboli Gardens or the Pitti Palace. Tickets will cost €45 in high season, €20 in low season and will be free for students. 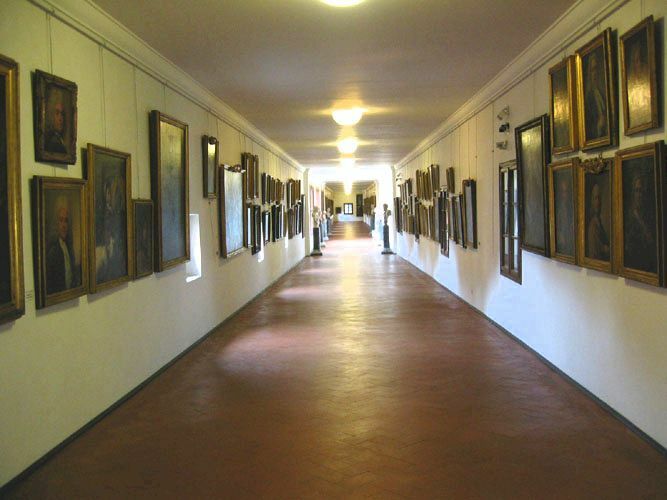 One disappointing aspect is that the many excellent self-portraits currently hanging in the Vasari Corridor will be removed because it won't be possible to climate control the corridor suitable for paintings on canvas and wood. The Administration of the Uffizi Galleries confirms that these promotional contents are totally unfounded. From 1 December 2016 until further notice the Corridor remains closed for works of safety regulatory compliance. Consequently no bookings will be accepted. False information is spreading on Facebook about nocturnal openings of the Uffizi and Vasari Corridor on various dates with visits organized by associations/groups which are unknown to us, such as Firenze Vista di Notte. The Administration of the Uffizi Galleries has already filed a lawsuit against the fraudsters and confirms that these promotional contents are totally unfounded." The official website for the Uffizi tickets is https://www.uffizi.it/en/tickets - once again note that many other official-looking web sites offer Uffizi tickets at enormous markups. Interior of the Vasari Corridor in Florence as it was until closed in 2016. The corridor was lined with paintings, the more interesting ones being an amazing series of self-portraits by famous and not so famous artists, including a surprising number of the Pre-Raphaelites - for example, a very fine self-portrait of William Holman Hunt. These pictures will now be displayed elsewhere in the Uffizi and will be replaced by thirty ancient sculptures along with a space dedicated to 16th century frescoes. The corridor had a doorway and still has a window opening into a balcony high up in the church of Santa Felicita so that the Medici family could attend mass privately, without being seen or subject to attack. The especially large windows overlooking the Ponte Vecchio were specially created for a visit by Mussolini in the late 30's. Part of the corridor snakes around the Torre Mannelli which belonged to the only family that Cosimo I was unable to buy out. Instead of building through the tower, Vasari built around it using a system of supporting brackets. 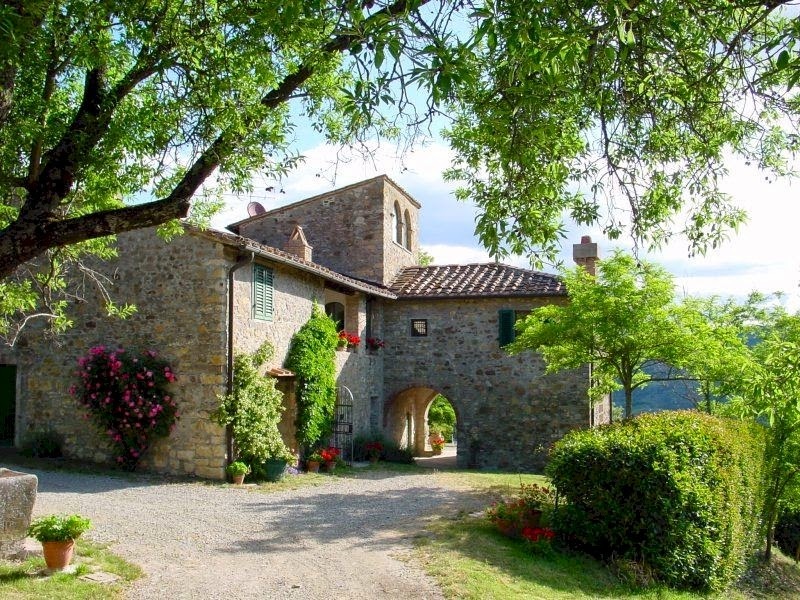 Cosimo was quite sanguine about this - every man is king in his own house, he reportedly observed. The meat market on Ponte Vecchio was moved to avoid its smell permeating the passage, its place being taken by the goldsmith shops that still occupy the bridge. 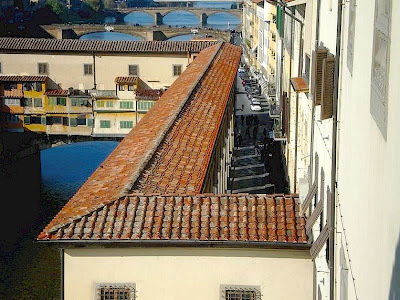 More about the Vasari Corridor in the 19th and 20th centuries.